Being in the athletic graphics industry, we see a wide variety of projects move through our shop. A lot projects can end up looking similar due to similar characteristics or execution. Occasionally, we come across a unique design or solution that catches our eye. Below are 5 recent baseball projects that really stood out. For nearly 150 years, baseball was played the same way with fielders taking the same position in the field each half inning. Today, you see the professional baseball teams running infield and outfield shifts for nearly every batter. Often times the shift can change depending on the outs, baserunners, or even the count. 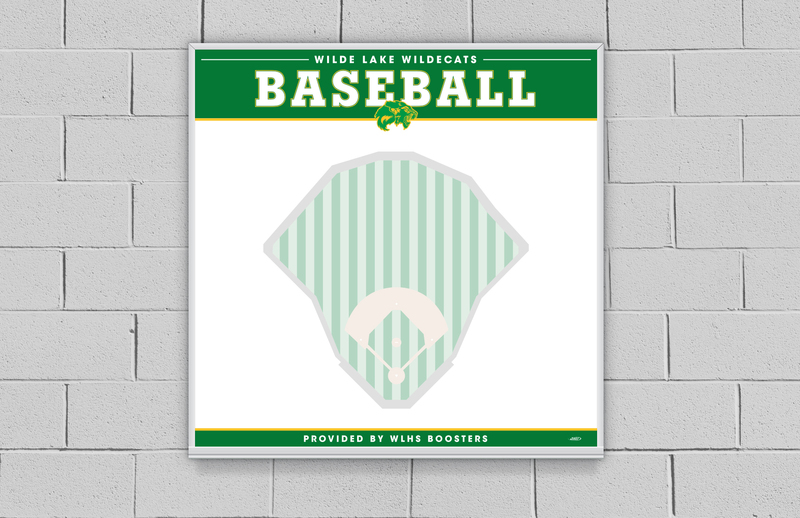 This custom baseball field dry erase board will help the Wildecat coaching staff script different shifts depending on the upcoming game situations. Outfield cutoff throws and bunt defenses can be scripted from a bird’s eye perspective allowing the coaches to communicate better with their players. Having a playable baseball field takes more time, energy, and money than most people realize. Mounds have to be rebuilt, fences have to be repaired, lips have to be cut out, coaches boxes need reseeding, dirt needs dragged, the grass needs cuts, and lines need to be chalked. 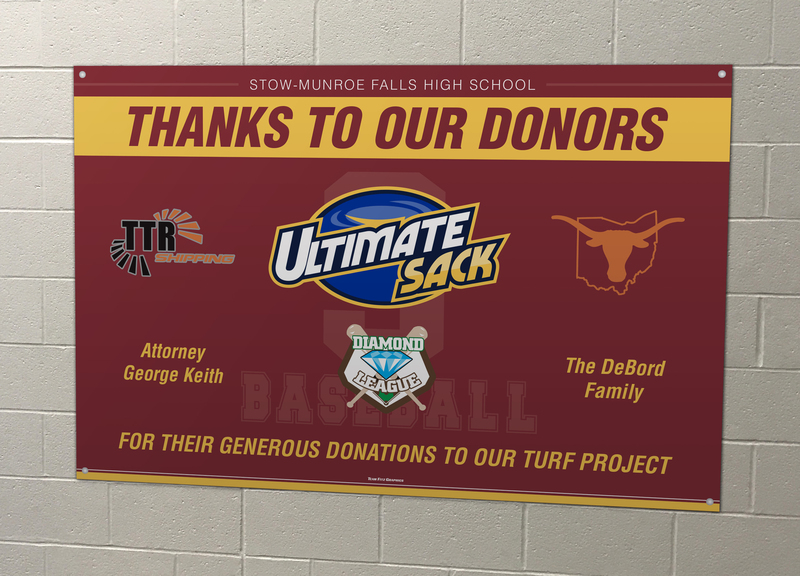 The donations of businesses, families, coaches, and others all make the baseball season possible. The simplest thing a team can do for all those contributors is to display a sign at the field to say thank you. 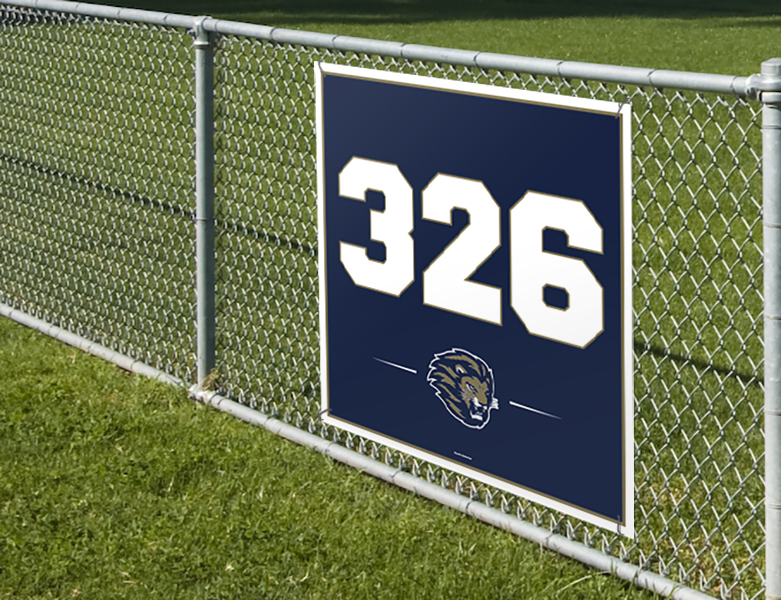 Quality outdoor aluminum signs can be inexpensively be installed on the back of dugouts, the fencing of backstops, or freestanding near the entrance. Summer baseball programs sometimes do not have the luxury of having their own facilities. Even some of the most well known and established programs play their games at the local school or park. The simple addition of branded windscreens can make a complex home. The Winter Park Optimists approached us about dressing up a few fields with matching baseball windscreens for their season. At the end of the season, the banners can be taken down and stored until the start of the next summer season. The first thing any hitter checks when getting to the field is how deep the fence is. Baseball is unique in that every field is different. Many fields have unique outfield fence lines, which creates tempting short porches or deep extra base potentials. At minimum, every field should have distance markers down the lines and then in dead center. Often times we produce distance signs for the power alleys as well. Lower Moreland High School has a fairly traditional baseball field, but in order to fit the soccer field in the outfield, a deeper center field is needed. Dress you field up with custom branded distance markers. Boosting attendance at baseball and softball games should be every program’s goal. The best way to get people to the game is to tell them when the team is playing! Morehead State University approached us looking for a 21’ x 7’ windscreen to display outside their stadium and feature their game schedule. This windscreen banner does a great job of dressing up the facility and communicating the necessary information. Additionally it is cost effective, making it feasible to replace each season. We worked with the Morehead State’s marketing department on the artwork to ensure the project turned out exactly as intended. At a price point that can easily be replicated each season, there should be no excuse not to highlight your upcoming season. At Team Fitz Graphics, we try to make sure every project is impactful. We always want to go above and beyond the basic signage and provide a dynamic piece that you are proud of. Reach out to our sales and design team today to get started in a custom proof and quote to dress up your facilities. We are excited about each project that comes across our desks, hopefully we can work with you and your program soon! Resources Careers© 2019 Team Fitz Graphics, LLC. All rights reserved.